Hear ye, hear ye! I welcome you to this fanciful hall! Tonight, we shall feast upon this glorious bounty of mutton and fried pig’s head, only to be washed down with the finest mead in all the land. Eat well, my good men, for on the morrow we shall wage a battle, the likes of which have never been seen by mere mortals. Do not be alarmed, men, for we shall reign victorious! You may be asking yourself, “How does he know this? He be a witch!” Not a witch, but a man of great intelligence, for I know exactly the kind of authentic costumes to wear. First, you must keep a clear head during this battle. The best way protect your uppermost point from an errant broadhead is to wear a chainmail coif. Although we first learned of this protective metal during the Bronze Age, we still use it during battle due to its flexibility and shielding capabilities. Though it may cost you a sack full of groat, ‘twill be well-worth the chance to tell your tale. Your authentic costumes will be sorely incomplete without this priceless piece of armor. Do not fear that your body will be slain. 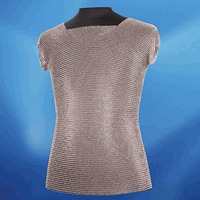 You can protect thy body in your authentic costumes with a blackened chain mail armor shirt. It may be a dreary day, and you will be sweating from hoisting your scimitar, so luck has it that these chain mail armor shirts are blackened to resist moisture. We dare you to try to dull or tarnish this wondrous piece of armor. It will not happen! You shall make us laugh heartily at the thought! You will also need to protect your hands from being lobbed off by the enemy. What better way to enhance your authentic costumes than with mail gauntlets? The enemy may be able to disarm you, but with these protective steel gauntlets, I guarantee they will not be able to dis-hand you. Your steed may be rendered useless in the heat of battle; therefore I wholeheartedly implore you to wear a suitable pair of boots with your authentic costumes. Your sword may be drawn and your fierce glare may instill fear within thine foes, but if you cannot remain mobile, you may end up in the same condition as a wether. May I suggest a pair of dragoon boots? Be quick, and you shall reign victorious! Sleep well, my good men, and take stock of your authentic costumes. The morning shall bring us face to face with our enemies. Be brave, my good sirs, but above all, be well-outfitted with the help of Pearson’s Renaissance Shoppe! Huzzah!